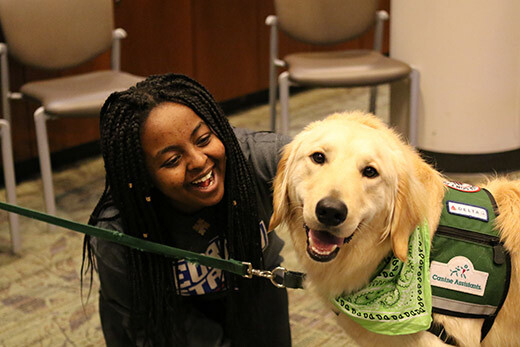 Students are all smiles when they spend time with the dogs at the Woodruff Library’s Pet Therapy Study Break, set for Thursday, Dec. 7, this year. Photo by Emory Libraries. Need to take a "paws" from preparing for finals and writing papers? Emory Libraries brings back its Pet Therapy Study Break on Thursday, Dec. 7, from 11 a.m. to 5 p.m. in the Jones Room at the Robert W. Woodruff Library. By signing up ahead of time, students have the opportunity to escape the end-of-semester stress by spending a few minutes with one of three dogs (a fourth dog will be available for walk-ins). The furry friends come from Canine Assistants and Pet Partners, two organizations that train therapy dogs. In addition, Emory Counseling and Psychological Services (CAPS) is introducing their newest canine employee — Finn, who has joined Beowulf as one of CAPS’ therapy dogs, and will visit the study break session. The two Native American Indian dogs, a breed with hair that can be more easily tolerated by people with allergies, are available through CAPS to help Emory students fight off stress and anxiety throughout the year. Woodruff Library’s Outreach and Education team has organized the study break since its beginning. This pup study break, which marks its sixth year in the Woodruff Library, is one of Emory’s most popular and memorable events. The dogs consistently charm and rejuvenate students. Megan Jiang, a junior majoring in biology and classics, went to the study break last year as she was dealing with the pressure of exams and extracurricular activities. “I left feeling more refreshed than I had in a while,” Jiang says. Kate Nowak, a senior majoring in history, echoes this sentiment. “It was really a great way to relax even with exams right around the corner, and I’ll definitely be signing up to go back and see them again this year,” she says. Since the study break is a library event, it is easily accessible for students. Sindoos Awel, a junior majoring in human health and anthropology/human biology, says that the dogs were in a convenient location since most students were already in the library studying for their finals. “The dogs were playful and energetic, which was an interesting contrast compared to the students, including myself, who were drained and a little less lively,” she quips.